Bold straight lines characterize the Monolith Award. Its design exudes strength and success using a classic shape. 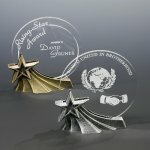 The award is available in three sizes. The Monolith Indigo Award has an optical crystal base that rises into a deep blue body with a diamond-faceted peak. 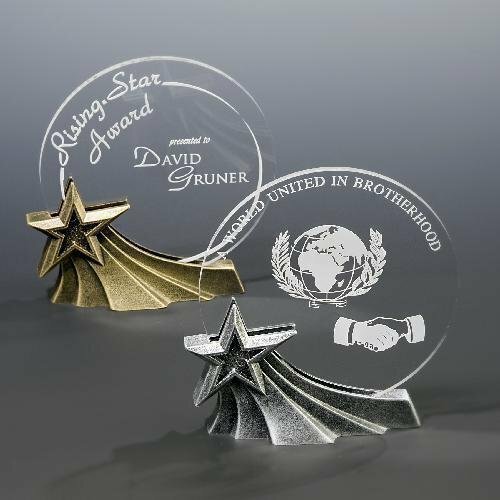 This award can be customized with your personal message and image, and it is available in three sizes. Two opposing crystal waves swell up towards the heavens. These crashing crystal waves represent the ascent to greatness and should be used to honor those that aspire toward greatness. A 3-tiered award that will catch anyones eye. A well-crafted obelisk sits atop a perfectly shaped ball all glued on a beautiful black crystal base. A truly monumental award. This award is made of 3 tiers with an oblelisk atop a globe which is glued to a beautiful black base.